I kid you not. After I knit my last Christmas gift, washed the last holiday dinner plate, and threw out the final scrap of wrapping paper, I was utterly thrilled to face the freedom of unabashed, unfettered knitting time. So many lovelies to dive into. And boy oh boy, did I dive. A pair of Marie Wallen mitts (finished by the way), a sweater for baby Rose to match her big sister's, a sweater for me, a hat for Jay, some new socks, Clue 1 of the RCYC MKAL, and . . . You see my problem? Who gave me permission to go stark raving knitting crazy? Oh yes, it was me. There in lies the problem. I have no self-control! January's Year of Hats. Of my, so many bobbles. And cables. And glorious, woolly yarn. It even smells like wool - one of my favorite scents. I am loving this new Germantown yarn. American thru and through. Squishy. Stretchy. Bouncy. Beautiful stitch definition. A keeper, for sure! Hopefully I'll have this gem done before the next Year of Hats design hits the scene on February 15th. Romi's RCYC Mystery Along. OK, Romi. Need I say more. And I must really love her designs, 'cause this is my second time knitting this one, having test knit the first draft. Its pink, so that helps. And again, it's Romi! Hope you all are knitting along too, enjoying the mystery. I know it's a little more challenging than past RCYC Mystery Alongs, but as one fellow Romi enthusiast said, "Just trust the Romi." Bressay. Several years ago, Jay and I spent a day in a lovely city on the Northern most point of Scotland - Kirkwall. As well as enjoying a wee dram, the oh-so-delightful people, and the bitter cold, we stumbled upon a small shop selling sweaters made from Jamieson's of Shetland wool. Beautiful? Yes. Expensive? Oh yes, you betcha. What's that phrase - 'I could make that?' 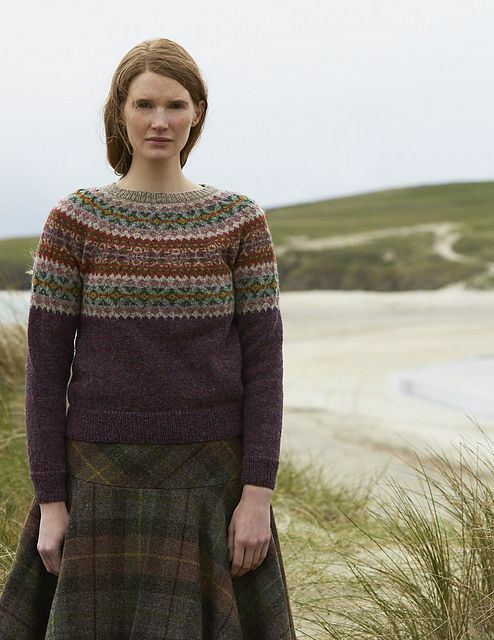 Well, Marie Wallen's Bressay is my "I can make that" sweater. Sleeves underway (super slow going, on 2.75 mm needles), can't wait to dive into some colorwork. Those are my top three indulgences right now. Then there's the socks, baby sweater, mittens, hat for hubby, box of yarn from England that's as yet uncommitted, etc., etc., etc. Not to mention the many other UFOs tucked into baskets, cupboards, shelves - pretty much every corner of my house. Commence the mantra - "enjoy the journey, enjoy the journey, ENJOY THE JOURNEY!"